655 W. Vistoso Highlands Dr. Surrounded by the Catalina and Toralita Mountains, lies the Vistoso Resort Casitas. 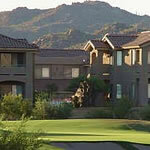 The vacation rentals are secluded in the Master Planned Community of Vistoso. 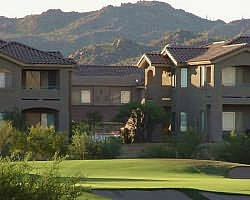 The two and three bedroom villas overlook the Golf Club at Vistoso, one of the top rated public golf courses in Tucson. Each two and three bedroom villa is individually designed with a unique style and décor. Accommodations range in size from 1,240 – 1,730 square feet and are complete with a full kitchen, living room and private balcony or patio. Amenities at Vistoso Resort Casitas include a 24-hour fitness center, tennis court and outdoor swimming pool. Nearby enjoy some of Tucson’s finest restaurants and attractions.